Cycling has afforded me some interesting experiences, as well as keeping me fit, letting me see some of the most beautiful places in the world and making a lot of great friends. My newly-acquired Chesini Olimpiade was not quite up to standard mechanically and on Tuesday during a break in the omnipresent rain I rode the short distance (it would have been short except for my classic Lost Boy detour that enabled me to see considerably more of Düsseldorf than I had planned) to Ricci-Sports to drop off the bicycle for some work. High on the agenda was to change the appalling 18mm tires. When I rolled in, Richard was seeing another customer, so he sat me down with Reg Harris’ autobiography to while away the time. Soon enough we were discussing the fine points of cycling history and the needs of the Chesini over a glass of Mt. Ventoux rosé. Richard told me about the joys of riding a singlespeed bike and pointed out the cosmetically-challenged bike in the stand next to the Chesini. It was a 1940 Umberto Dei that had been set up as a singlespeed and which he said rode fantastically well. He suggested I take the bike outside for a spin around the block, but since it was pouring rain again at this point I demurred. After we had agreed on the work to be done on the Chesini–I have no idea how I am going to ride L’Eroica with no gear smaller than a 42-24–I was about to walk home when he pressed a bottle of 2008 Gino Bartali Chianti (yes!) upon me but then insisted I ride the Dei home. At first I thought he was joking but he was quite serious and we headed out into the rainy streets. The Dei does not look at all like a modern bike, being very long and having narrow handlebars that pretty well force you to ride in the drops, although it is not uncomfortable to do so. It fit me extremely well and I found the long saddle typically found on bikes of this period extremely comfortable. I followed Richard, who had lights on his bike, and quickly found that the bike, which ran completely silently, was a pure joy to ride. It accelerated very quickly and smoothly, although once at high speed my reflexes wanted me to shift higher. The non-original Universal brakes are very uneven in application and pretty noisy so I just avoided using them to avoid, as the young people say, harshing my mellow. After seeing Richard off at his place, I continued on home and was surprised how quickly I arrived. I put on a headlight and a flashing taillight to continue the ride and headed back out into the night. It was a bit late and I had not eaten, so I broke down and rode over to the all-night McDonald’s on nearby Grafenberg Allee. Riding in the cool darkness on this black museum piece was wonderful and my doubts about singlespeeds were erased as I laughed out loud on the bike. Now some history. Umberto Dei began building frames in Milan in 1896 and within a few short years was recognized for his meticulous craftsmanship. Although noted particularly for track bikes, his road bikes were also conspicuous for their success under riders in the Giro d’Italia and many foreign teams riding in the Berlin Olympics in 1936 chose Dei bicycles in spite of their higher cost. The workshop was destroyed in a bomb raid in 1943, along with Signore Dei’s home, but he rebuilt and continued to construct fine bicycles. In his workshop some of Italy’s renowned framebuilders learned their craft under the master, Faliero Masi among them. Following Umberto Dei’s death, the rights to the name ended up with Atala and today the brand still exists for a range of elegant, albeit heavy, city bikes that are of no great interest to lightweight classics lovers. The Distinguished Milanese loaned to me has a number of interesting characteristics. 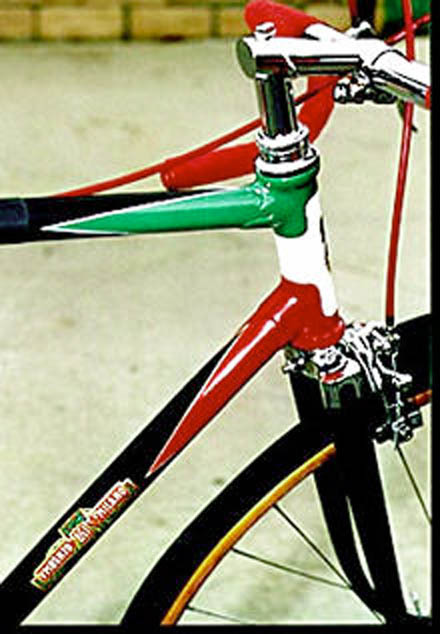 The Gara stem is original, judging from the few photos I have found of Dei bicycles of the period, and in superb condition. The bicycle features, to my surprise, an integrated headset, the lower section of which would not be out of place on a new carbon bike. The fork has an impressive crown and is half-chromed, from the tips upwards. Near the tips there is a screw on each side, presumably for mounting fenders. The headtube features some rather elaborate lugwork with a kind of slotted effect, echoed in the lug at the top of the seat tube. The seat stays are sturdy-looking indeed, and again end in a chromed section, with another little screw in each side. The chromed dropouts are nicely finished, and nearly horizontal. The saddle is fairly narrow but unusually long and is festooned with lovely little copper rivets on the nose and tail. The only accessory is a cartridge-style inflater from the period, proving once again that there is nothing new under the bicycling sun. The bicycle looks a bit stretched-out, with the rear wheel some distance from the seat tube. One has the impression that there is clearance for any kind of tire you might like to put on this bike, reflecting the fact that bicycles of the period often had to serve other purposes for their owners besides as racing mounts. The wheels of this particular bike are fairly modern and are interesting in their own right besides having tubular tires. Featuring high-flange Campagnolo Record hubs and tied and soldered spokes (the first I have ever ridden on), the wheelset came from a bicycle used by German pro cycling star Dietrich “Didi” Thurau, who wore the Yellow Jersey for 15 days in 1977 and won Liege-Bastogne-Liege in 1979, as well a being victor in no fewer than 29 Six Day Races. The Umberto Dei is a superb bicycle, showing not only excellent craftsmanship but skilled execution in design, judging from its handling. The bicycle’s glorious decals are pretty much undecipherable now and the paint has seen better days but there is no rust nor any dents. In seven decades it has come a long way: through wars and new generations, and somehow wandering from Italy and Germany and ending up, for a short moment, ridden by a Canadian. I am grateful for the opportunity to ride this time machine. It wears its patina well and I hope that I will be in as admirable condition when I am 70 years old. Wow, pretty special bike. And you are going to ride Eroica? When is it on? Yes, I really am not that keen on the idea of giving back the Umberto Dei! I have already booked a hotel for L'Eroica 2011, the first weekend in October. I was planning to bring the Chesini to save the Raleigh's perfect paint on the gravel roads, but it looks like my lowest gear might be a 42-24 compared to the Raleigh's 39-28. Germany is great, especially on those rare occasions when the sunshines. The Mehlspeisen is deadly.